Charles Peter “Chuck” Doyle was born to be a pilot and stunt man. Impressed with Charles Lindbergh’s 1927 solo flight to Europe, Doyle talked his father into taking him to the Minneapolis Airport where he was given an air ride in a Navy trainer. In his teens, Doyle owned a Harley Davidson motorcycle and cut classes at Washburn High School to ride to the airport and hang out. In the summer after his junior year, he offered to trade the motorcycle for flying lessons, but instead was given work helping to rebuild airplanes. He soloed in an airplane that summer and borrowed money to purchase his own Travel Air biplane. During the 1933 fall homecoming football game at the high school, Doyle buzzed the field and was promptly dismissed from school. He would finally graduate from Washburn in a colorful 2002 ceremony! At the airport, Doyle earned a living working on airplanes, selling tickets for barnstormers, and performing daredevil stunts. In 1935, Doyle made his first parachute jump at the Minnesota State Fair and towed his first aerial banner for Griffith Shoe Polish. He had learned the fine art of skywriting from local veterans and rigged his plane to fulfill local Pepsi Cola assignments. In addition to the flying, Doyle also began to take part in other thrill show events at fairs and celebrations across the country, performing such stunts as driving his motorcycle through burning board walls, head-on auto crashes, crashing airplanes through ‘houses’ built within fairgrounds, as well as climbing from his speeding motorcycle to an airplane by means of a rope ladder hung from the airplane. He used his motorcycle and ramps to jump over cars long before Evel Knievel was born. Despite the spectacular lifestyle, Doyle was never injured. During WWII, Doyle worked briefly for Northwestern Aeronautical Corporation in St. Paul, building gliders that were used by the Army to land troops behind enemy lines. In 1942, despite having no college education, he was hired by Northwest Airlines in January of 1942 after Pearl Harbor as a training instructor and taught at Rochester, Minnesota. When Northwest was contracted by the Army Air Transport Command, he was assigned to fly Northwest transports in Alaska, making flights as far out as the Aleutian Islands. Following the war, Doyle bought war surplus aircraft, flying, restoring and racing them at Reno, Nevada. Many of his airplanes found their way into museums, including three in the Air Force Museum at Dayton, Ohio, and a Curtiss Pusher aircraft that hangs in the MSP Airport’s Lindbergh terminal. Doyle’s airline career with Northwest continued until his retirement at age 60 in 1976 after 34 years, but his flying career wasn’t over. From his home airstrip in Apple Valley, Doyle continued to sky-write and tow banners. The airstrip’s signboard heralded “UFOs Welcome.“ He owned and flew dozens of aircraft and had his hand in many Minnesota aviation projects, including the publishing of a Minnesota aviation history book. When the City of Apple Valley condemned his property for highway right-of-way, Doyle moved his planes to Fleming Field South St. Paul MN. 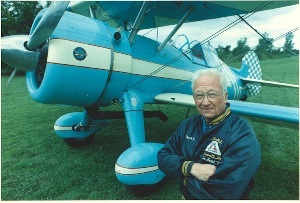 He knew everybody in aviation and lived flying and restoring airplanes every day of his life. Both sons, Chuck Jr. and Brian, were taught to learn to fly by their father and are pilots and continue the family’s tradition for the love of aviation. Daughter Shannon would fly only with her father but respects their love for flying. 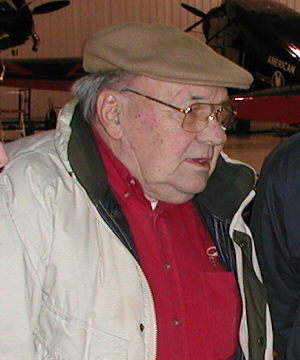 In 1992 He was inducted into the Minnesota Aviation Hall of Fame, in 1996 the OX-5 Hall of Fame, and in 2003 Warbird Hall of Fame. 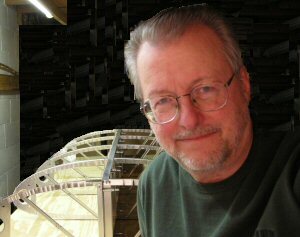 Chuck was a member and supporter of many other fine aviation organizations, including EAA Chapter 25. Chuck Doyle is survived by two sons, one daughter and four grandchildren. A memorial service will be held Friday, May 2nd, 11:00 AM at Shepherd of the Valley Lutheran Church, 12650 Johnny Cake Ridge Rd., Apple Valley, MN, with a gathering of family & friends one hour before the service. Private family interment at Ft. Snelling National Cemetery. Long-time chapter member and past ChapterÂ President Paul Wilcox passed away on Sunday, October 28th, at home.Â Paul was a Naval aviator during World War II and involved actively in Twin Cities aviation for many years. Funeral services were held on Thursday, November 1st, at Christ Episcopal Church in Red Wing.Â We urge all members to share their memories of Paul via this website. Please email Jon Cumpton at [email protected] if you would like to do so, or simply add a comment here.